Exceptionally powerful Kenwood KM020 food mixer with automatic electronic speed control with pulse, so it maintains speed and power regardless of the load. The ultimate in kitchen machines with a powerful 1500w motor and a 6.7 litre stainless steel bowl, the Kenwood KM020 Major is a serious machine for those that want a machine to deliver expert results every time. The Kenwood KM020 mixer has a 6.7L capacity stainless steel bowl with splashguard, and is supplied with stainless-steel K-beater, whisk, and dough hook attachments for all your kneading, mixing and whisking needs. There's also a flexible beater for creaming mixes. And, with its smooth head-lift action, changing tools is easy. 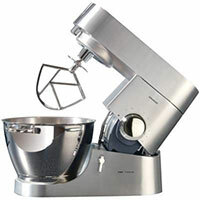 Of course, the KM020 uses Kenwood's unique `planetary` mixing action for optimum results - and quietly. The Kenwood KM020 Chef Titanium also has 4 power outlets, so you can add over 20 attachments, for all your preparation needs.